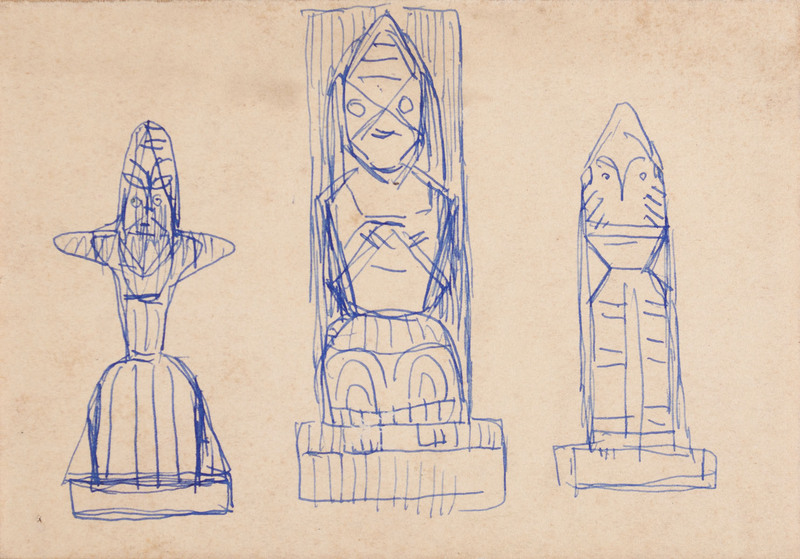 Jamini Roy’s inspiration of folk art led him to experiment with sculpture along with paintings and sketches even though he had no formal sculpture training. 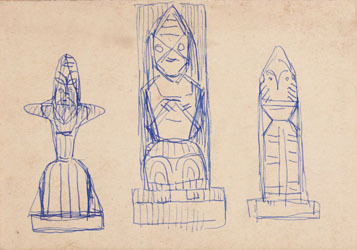 This artwork depicts a preparatory sketch of three sculptures similar to crude dolls from folk art. The viewer can see the block of wood and how Roy has planned on removing sections to make a complete sculpture. While this doll sculpture looks different from the typical doll, it can be considered to be an altered, abstract version of it. The drawings are works on their own but his sculptures are more than just complements to his drawings. Intrigued by shadows, frontal view, silhouettes and the profile view of the sculpture, Roy uses the sketches to plan out his ideas on paper.